Critical Success is a resource for new GMs and players as well as experienced role-players who want to spend time thinking about game theory. James will be applying concepts from improv, writing and story telling to explain how you can sharpen your GM skills and make your game more fun for everyone. 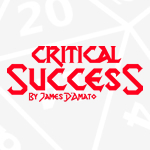 Critical Success will use clips from the ONE SHOT podcast so everyone can see these concepts in action. James sits down with one of the brilliant minds behind Double Exposure to discuss Metatopia, the Envoy program, and fostering an open gaming community. In this episode James tells you what’s so great about sailor moon character sheets, what you should do about describing actions in combat, and how to handle two players with the same specialization. James speaks to Jack Norris about the return of Blue Rose, Green Ronin’s new take on the original romantic fantasy RPG. We calk about changes to the setting, updates to AGE, and design goals for the new edition. James invites Jon and Jef from the System Mastery podcast on to the show to talk about bad role playing games and how to avoid making them.